Not a day goes by for most computer users without them using both their mouse and keyboard. But did you know that it’s easy to disable the keyboard in Windows? Maybe you keep accidentally hitting it and messing up your navigation, have children pressing it at the worst times, or just want to challenge yourself to get around without all those handy keyboard shortcuts Navigating Windows with Keyboard Shortcuts Alone Navigating Windows with Keyboard Shortcuts Alone You might know lots of keyboard shortcuts, but did you know you could get around Windows without your mouse? Here's how. Read More . 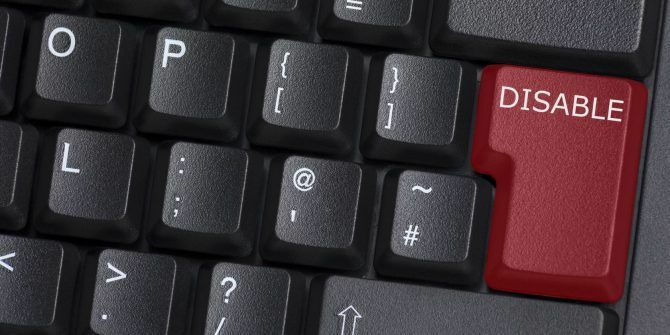 Whatever your reasons, here are several ways to disable the keyboard in Windows 10. Be sure to take advantage of mouse shortcuts Browse Faster and Better with Mouse Gestures Browse Faster and Better with Mouse Gestures Can't remember keyboard shortcuts? Prefer using the mouse at all times? You'll love what mouse gestures can do for your browser workflow. Read More in the meantime! If you just need to disable the keyboard for a few minutes to clean it or something, simply unplug it and/or switch it off! Windows won’t pick up any input while it’s not connected to your PC. Right-click on the Start Button and select Device Manager. Expand the Keyboards header and find yours listed. Right-click it and choose Uninstall device, then follow the instructions to remove the device. The device should stop working right away. After a reboot, the keyboard will likely work again when Windows automatically obtains its drivers. Use the free program KeyFreeze to disable the mouse and keyboard. This tool will block all input but keeps your session active — useful for letting kids watch a video without clicking around. Another free app, KeyboardLock, will do the same but is more flexible. This one lets you lock your keyboard or mouse behind a password. Anti-Shaya is another piece of software that works for disabling your keyboard with a password. This solution is also portable. If you find yourself without a keyboard involuntarily, make sure you know how to navigate Windows without one Learn To Navigate Windows Without A Mouse, Keyboard Or Screen Learn To Navigate Windows Without A Mouse, Keyboard Or Screen You just spent hours labouring over an important document when your keyboard dies on you. Would you know how to save your work, exit programs, and shut down your computer? We'll show you. Read More ! Have you ever needed to disable the keyboard in Windows? Do you use another method or tool to do this? Tell us in the comments!